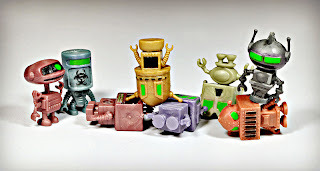 What: When I was browsing on Amazon recently I randomly came across some little plastic robot figures that caught my eye. It took me about 10 seconds to realize that I had to buy some! They are very small (around 1") and are each made of one-color plastic with minor paint applications (all of them have painted details on their faces and a couple have a bit of paint on their bodies as well). There are eight different sculpts, and an equal amount of different colors, each with a very cool slightly metallic look. The different sculpts are available in different colors, so if you want to get them all there are actually quite a few variations to collect. 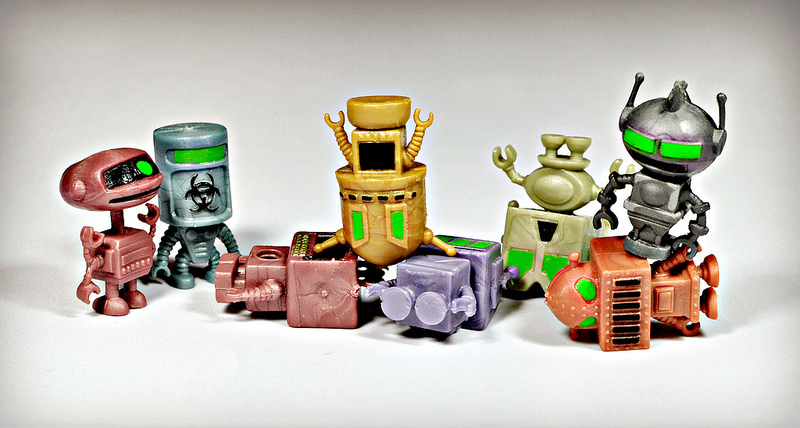 The name "RetroBots" is very fitting, since they immediately make you think of 1950s-1960s sci-fi pop culture. You can almost hear the exaggerated "bleep" and "bloop" noises when you look at them. I like them all, but I think my personal favorite is the orangey one pictured third from left above (I call him "Grillface." He actually looks a bit ticked off, doesn't he?). I am really glad I stumbled onto these. Fun stuff! When: I got mine in late 2012. I'm not sure how long they were around before that (I'm guessing they originated within the past couple years). Where: Although I bought mine online, these are made to be sold in toy vending machine capsules as you can see here. In addition to being available from bulk vending products vendors, at the time of writing this you can also still pick up some smaller amounts on Amazon from various sellers. Just search for "RetroBots." Who: From what I can tell these originated with A&A Global Industries, a vending products supplier. I just ordered a set for $6.48 + free shipping off Amazon. Thanks for the article! Looking forward to these. They were listed under party favors... makes me wonder if brick-n-mortar stores like Party City have them. Glad you were able to grab some! I wondered that about party stores too, but haven't checked any for them yet. You can still get these from Vending suppliers at around $50 for 150 figs!